V774104: That’s the name of the new dwarf planet astronomers revealed this week, and it’s three times as far away from the sun as Pluto. It’s the most distant object ever discovered in our solar system—and it could mean there are even more far-flung planets in our corner of the universe just waiting to be discovered. The announcement was made yesterday near Washington, D.C., at the 47th annual meeting for the American Astronomical Society’s Division for Planetary Sciences. Scott Sheppard, astronomer from the Carnegie Institution for Science, co-led the team behind the discovery, and he made the announcement on Tuesday. 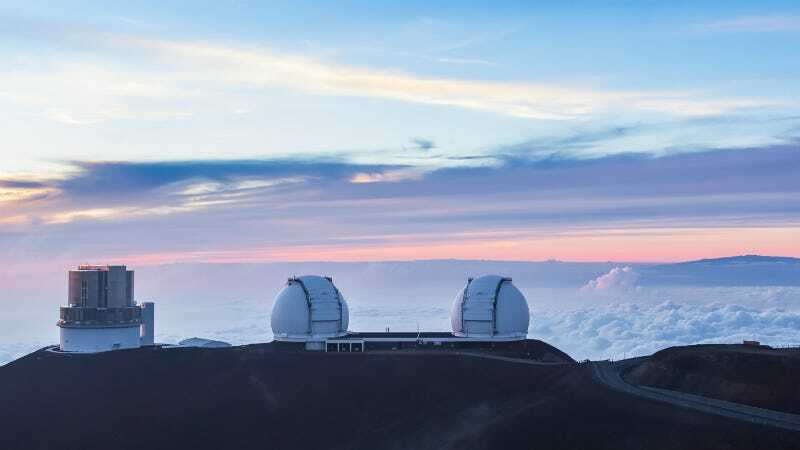 Japan’s 8.2-meter infrared Subaru Telescope, based on the summit of Hawaii’s Mauna Kea, found the dwarf planet. It’s estimated to be between 310 and 620 miles wide, around half of Pluto’s size. This officially makes V774104 the most distant object in our solar system. For those keeping count, that means it’s 9.6 billion miles from the sun, or 103 astronomical units (AU). One AU = the distance between the sun and Earth. The previous record-holder was a different dwarf planet named Eris, which was discovered a decade ago, and is “only” 97 AU away. So, why is this cool? (Other than the fact that we found a brand new dwarf planet that’s been hiding in our solar system all along?!) Well, it suggests that our solar system is bigger than we thought, and it could be populated with even more so-called “rogue planets,” Science reports. Scientists will continue monitoring the new object’s orbit over the next year. If it stays far away from the sun, it could mean that it’s just one of only two other rare icy bodies on the very fringes of our solar system, farther away from the sun’s gravitational influence. That could mean that something other than the sun is influencing the erratic orbits of such small objects like V774104. One theory is that a giant, dark planet that’s yet to be found–because it’s so far out–is affecting the orbits, or that this hypothetical giant disturbed these smaller objects’ orbits as it was being ejected from our solar system. Whatever the case, this week’s announcement is a step closer in discovering more celestial objects nearly a full solar system away, and unlocking even more space secrets.